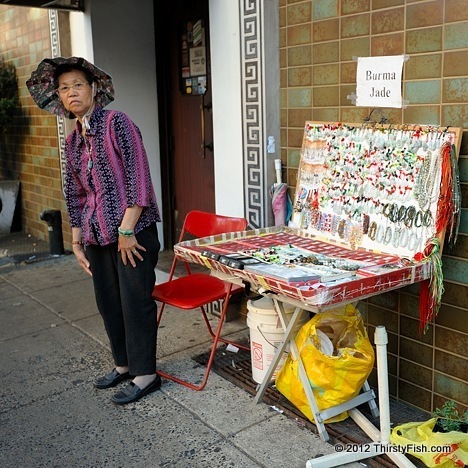 This is another photo from my photowalk through Philadelphia Chinatown last weekend. Human beings have always had a fascination with gemstones. Clear or colored stones have been a commodity throughout history. Some believe in their mystical and healing properties. They are used as jewelry, carved as artwork, and crafted to decorate weapons and luxury items. Jade, is the name applied to two different greenish metamorphic rocks that are made up of different silicate minerals, which were once once thought to be the same thing. In the Chinese Empire, jade imported mainly from Burma had a significance comparable with that of gold and diamonds in the West. With China gaining economic might, jade has seen a revival, with the finest jade, from Xinjiang, becoming more valuable than gold. It fetches more than $3,000 an ounce. I don't really understand the commotion around gemstones, gold or diamonds. Here is some food for thought, from the TV series Game of Thrones: "Have you ever been in a city under siege? ... Food's worth more than gold. Noble ladies sell their diamonds for a sack of potatoes".